This was the first “real” birthday party I’d given for my boys. 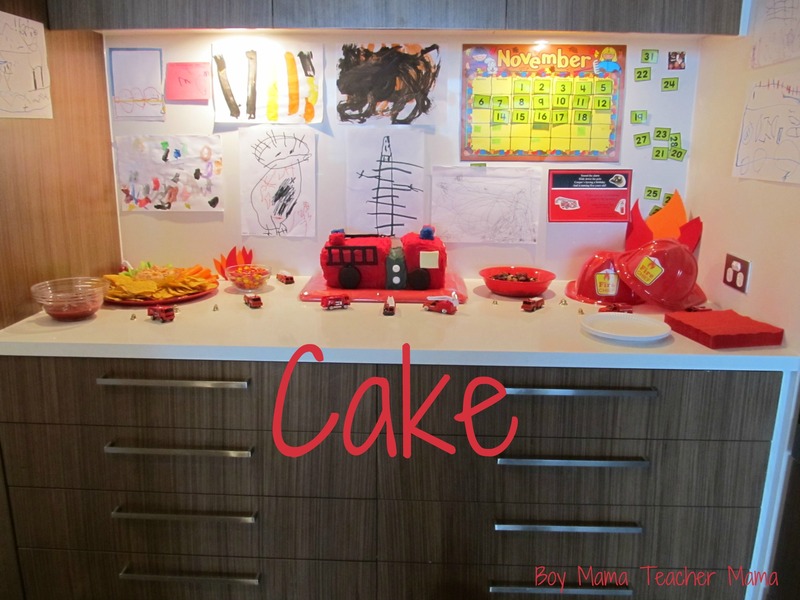 Until now, we would do dinner at home and cake with a few relatives for the boys’ birthdays. 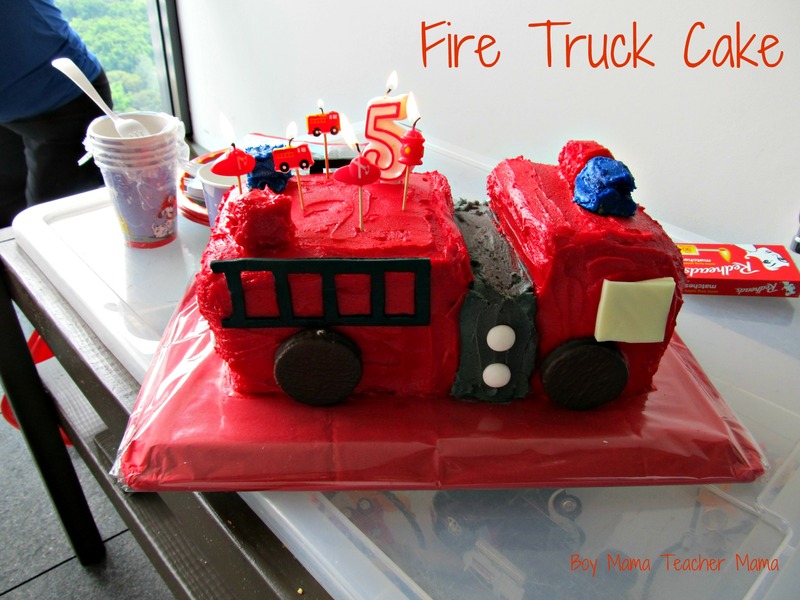 But, my son was turning 5 and I thought it was about time to give him the real thing. I asked him what kind of birthday party he wanted and his answer? Firefighters! And I was off and planning. 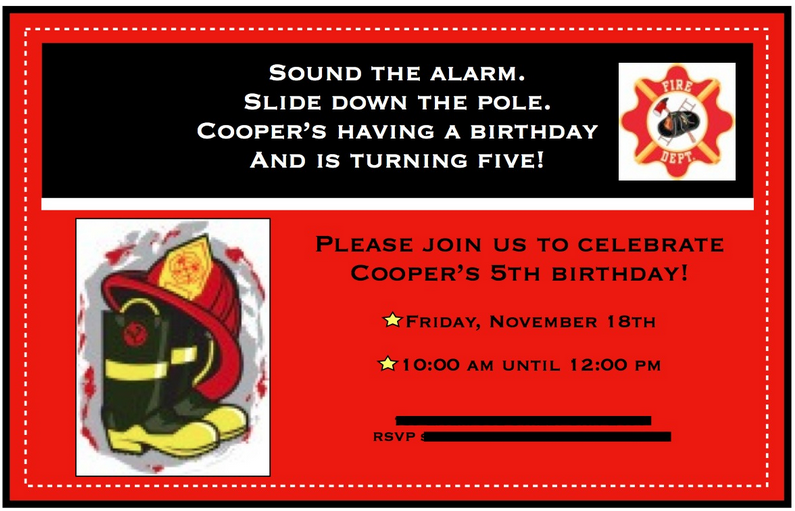 I created this invitation on my computer and had it printed out at the local copy shop. The pictures are actually stickers I found at the local grocery store. I found a great website here in Australia for all things firefighter. I ordered a bunch of stuff from the site and the rest of the items came from a party store or the grocery store. 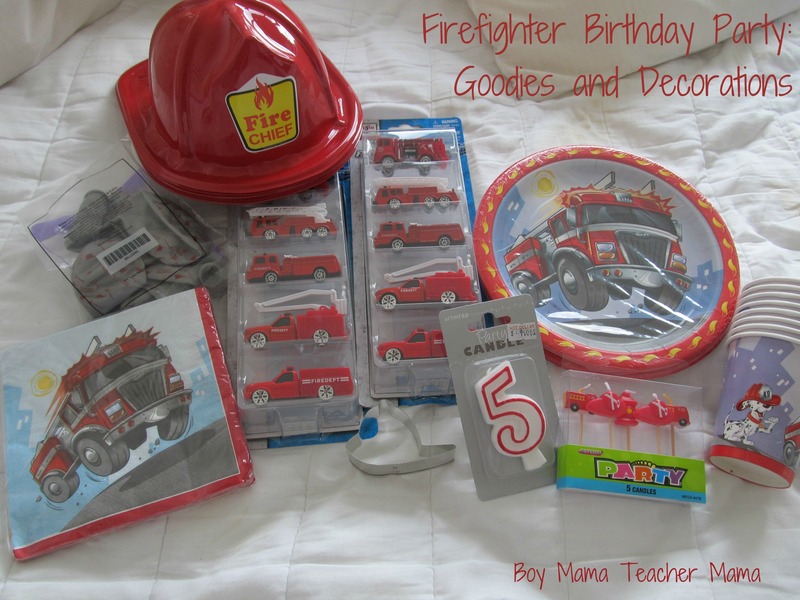 I love, love the balloons with the firefighter gear on them. 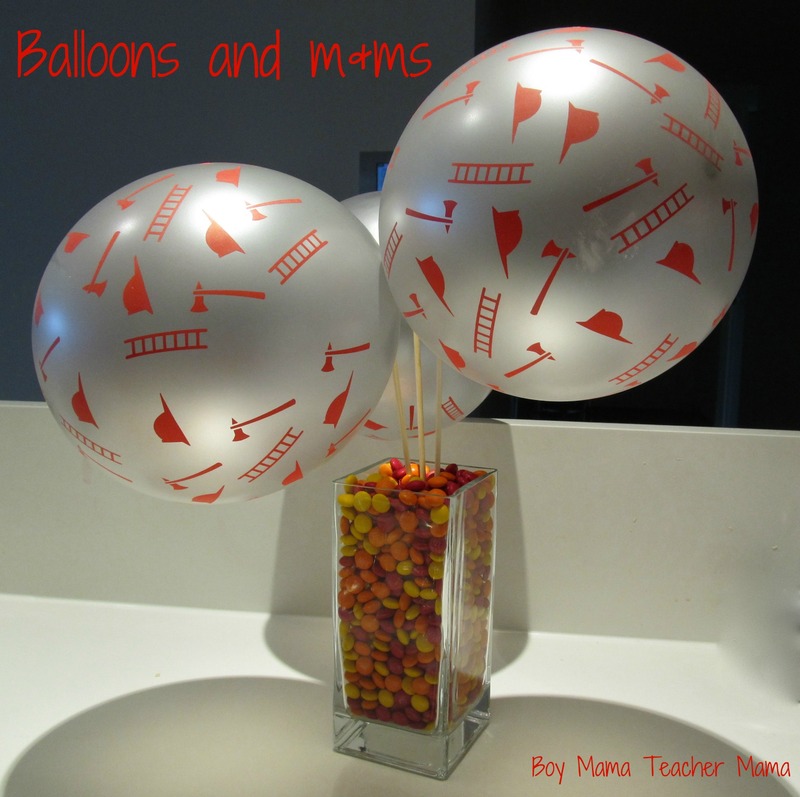 I tied the balloons onto skewer sticks and put them inside a vase filled with “fire colored” m&ms. That certainly took a lot of sorting! The orange and red balloons are also tied to skewer sticks and taped into place. 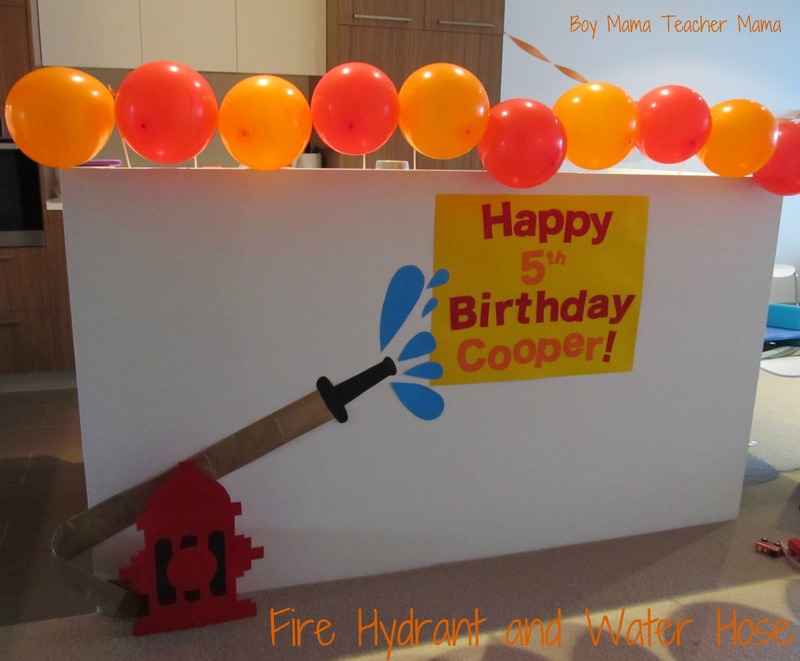 I created the fire hydrant, water and the flames from poster board. The hose is made from gold wrapping paper. 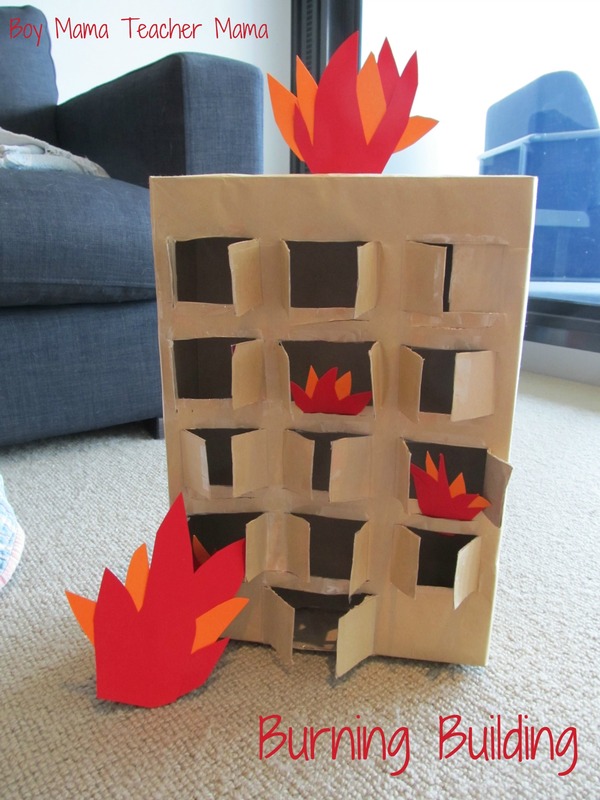 You can see how I made the burning building on our post, Boy Mama: Cardboard Box Use #2,490. 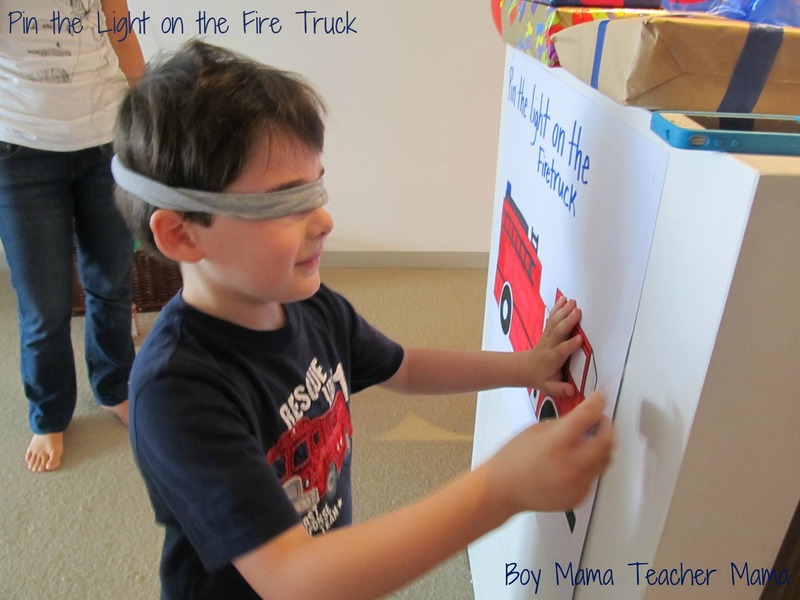 Below I created a very simple, Pin the Light on the Fire Truck Game. I wrote each guest’s name on a set of “lights,” and we played the game during the party. 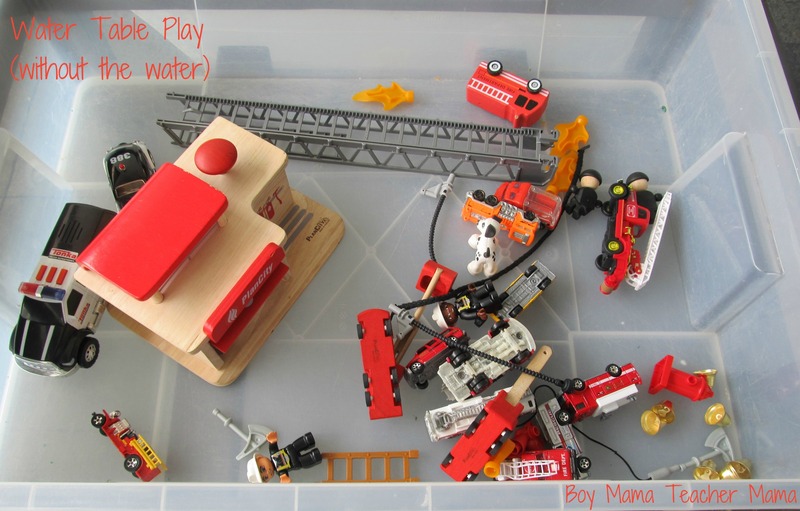 I also filled our water table (without water) with all the smaller firefighting toys we had. 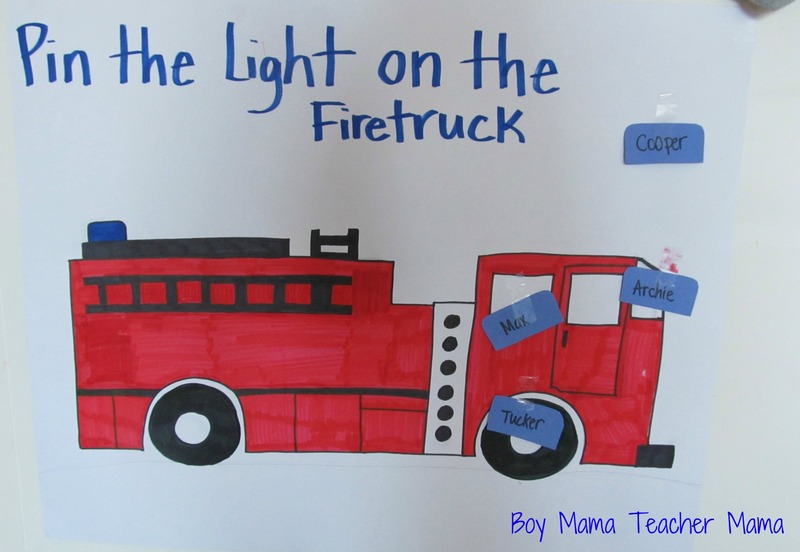 Larger fire trucks and such were scattered about the room for the children to play with if they chose to. 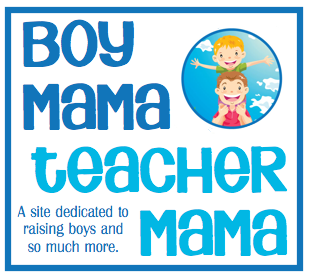 Here is how it all came together! 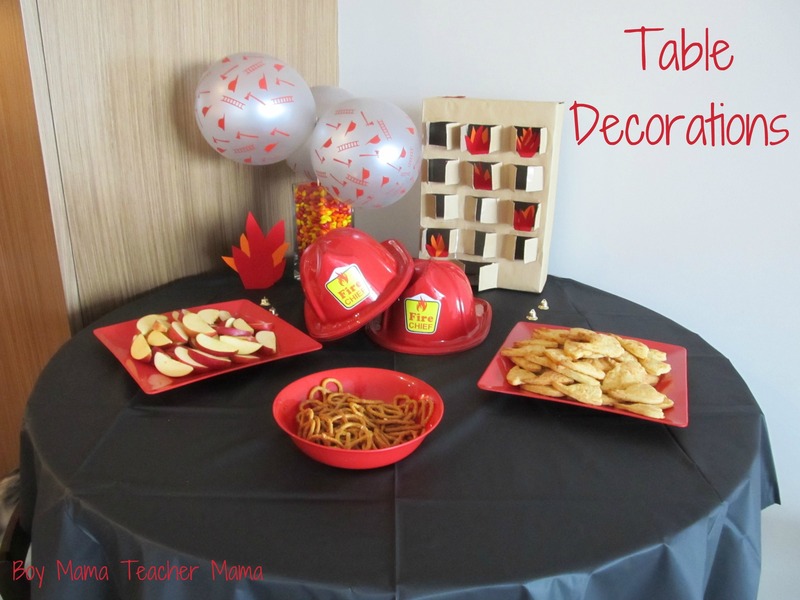 The crackers on the right side of the table are homemade Goldfish crackers in the shape of fire helmets. I bought some small bells from the craft store and scattered them around the food areas. 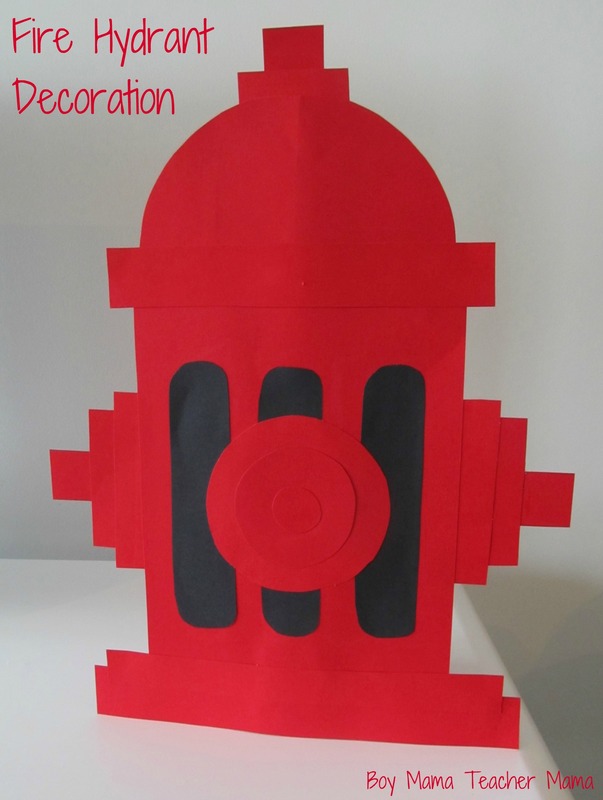 I also purchased a bunch of small fire trucks and used them to decorate the tables as well. 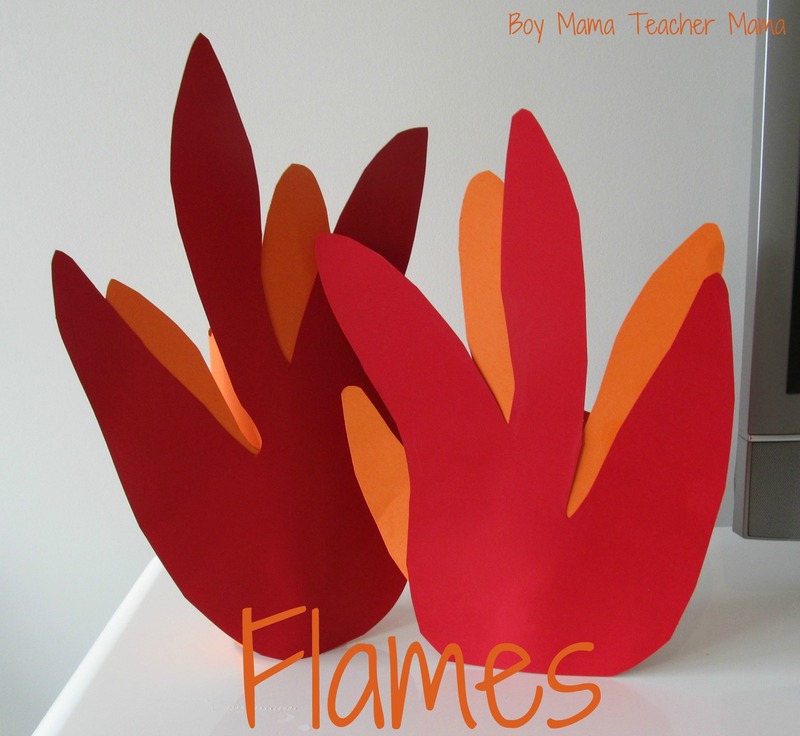 I created a Fire Truck Songs CD and gave a copy to each guest. Here are the songs that I included on the disk.